I'm no big sports, I'm not even a supporter, and I don't like soccer. I must say that I have no intention to hurt the feelings of those who, supporting a team put in this activity all the genuine passion they have. I'm convinced that many supporters, my father firstly, rediscover with soccer a mix of childhood memories and a rooted empathy with those eleven players (they're eleven, aren't they?) running after the ball for the 90 and more minutes of game. Tonight I would like to let you discover a book that to me embodies the essence of sportive spirit: something that, to my very modest opinion, is slowly going lost in our country. I believe this is symptom of many other factors, that go way beyond soccer, and that would need a sociology treatise. As you can deduct from its cover this picture book is set in Africa, in South Africa to be precise. 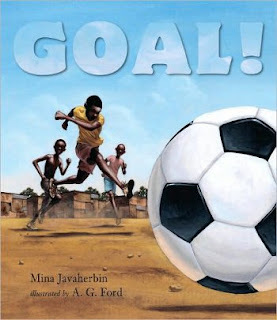 A group of kids from a bidonville plays a very concise game, always in alert, ready to defend their treasure: the ball. In those places where poverty reigns undisputed, a ball is a real treasure, as it represents a luxury: the luxury of playing, the luxury of being - for once - simply kids. The message of this book is strong, neat and illuminating. I believe that all children live soccer as a moment of pure joy, of aggregation, of game as simple as that, and this is even truer for those kids that have not much more than this. I've never been a big fan of hyper realistic illustrations though, in the oil tables by A.G. Ford, there is something of definitely appealing, something I would dare call magic: for the ability in reproducing the character's expressions, for the sinuous movements, for the skill he has in recreate the atmosphere of tension and expectation typical of a match, the great sensitiveness with which he can represent a dignified poverty that never declines into obvious, into oversentimental. the wonderful blog Seven Impossible Things Before Breakfast: http://blaine.org/sevenimpossiblethings/?p=1931 , where you shall find some beautiful spreads and a short interview with the author. And here you may find an interview with the illustrator. I must confess that I too, as a child, have known the fervour of supporting: it was 1982, we had just won the World Cup and Sandro Pertini* was the bigger supporter. I remember I danced and screamed until I had no more breath left, I didn't know exactly what for, I had more the feeling I was possessed by some strange wild spirit, I felt like the lighting conductor of general excitement... though I remember it as a nice feeling, liberating. * Former Italian President and partisan during World War II. Isn't it a great book?! It is a great book indeed, I totally fell for the illustrations! And I loved the book in the whole, a great concept and even better execution. Thanks to you for highlighting it in your wonderful blog!!! I felt the same way... I'm not a sports fan, and I know very little about soccer (or football, as some would say) but I loved the illustrations in this story.